This 7-night cruise of the Rhine, Main and Moselle Rivers explores the wine regions of French Alsace and Germany’s Rheingau and Moselle Valley.Germany’s most prized vineyards and wineries here produce the elegant white wines and pinot noirs that command extraordinary prices at auction.The Romans first planted vineyards here some 2,000 years ago.Visit the fairytale-like villages of Rudesheim, Wertheim, Miltenberg, Bamberg, Trier, Wurzburg, Volkach,Explore stunning Strasbourg France and historical Nuremberg.Join your host, Arthur White, sampling his best wines in contrast to Alsatian and Moselle Valley vintages, paired with first rate regional cuisine. Special events are planned along the way. 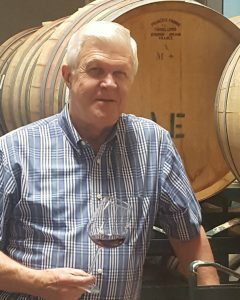 Art is the President and co-owner of Santa Ynez Wine Corp., which is the parent of Arthur Earl and Alexander and Wayne wineries. He is also the winemaker for both. In 1992, he partnered with longtime friend Earl Brockelsby to purchase a small Santa Barbara County winery. Having spent the first few years focusing mostly on the day-to-day business and marketing aspects of the winery, in 1995 he assumed full responsibility for the winemaking function. All in all, Art feels that winemaking is a complex combination of art and science. While it takes good chemistry to make good wine, successful winemakers are able to combine that science with the individual artistry of their craft to make great wines. Alexander and Wayne, the original winery, has always focused on the traditional California varieties native to the French regions of Burgundy and Bordeaux. These wines include Chardonnay and Sauvignon Blanc for whites, and Pinot Noir, Cabernet Sauvignon, Merlot and other Bordeaux varieties and blends for reds. Arthur Earl was started in 1997 to focus on varieties from the Rhone region of France as well as select varieties from northern Italy. These wines include Viognier and Pinot Grigio for whites, and Syrah, Grenache, Nebbiolo, Barbera, Sangiovese and other Rhone and Italian reds and whites. Art is also a WSET Level 3 Certified Specialist in Wine and a member of the Chaine des Rotisseurs. Please note: The Rhine & Moselle River wine tour and cruise program is created solely for the Arthur Earl Winery by our tour operator Tours & Wine (by Expanding Horizons) of Tustin, California, in conjunction with AmaWaterways. The program will contain private meals, tours and/or visits to attractions outside of scheduled cruise activities. These additional services are exclusive to guests on this cruise who book their reservations with Expanding Horizons. Persons booking with alternative travel agencies will not be included in these activities.